We love our clients testimonials and all of them would personally love to hear from you, so let us know!! I just wanted to say: An enormous thank you for last night! You and your staff did a phenomenal job. It was really just perfect. Everything was absolutely delicious. It was so beautifully presented. So many complements on everything. Your staff was incredibly helpful and sweet and so nice to work with. So, kudos to you! Great team and great job! Anne and I are both back in Boston for the first time since the wedding, so we wanted to sit down together immediately and tell you what a fabulous job you did for all of us. We now fully recognize how unrealistic our initial expectations were for what would be required to produce the kind of destination wedding that we wanted. But you helped us through the process, you listened to what we wanted, and you corralled an enormous group of vendors from all corners of New England to work together seamlessly. 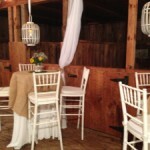 Who would have thought that a “barn” wedding would be so much more complicated than one in a more typical venue? 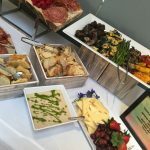 Every detail, every piece of equipment, every service, every element of decor had to be planned and procured as if it had never been done before, and yet you found people to take care of everything. From the rehearsal dinner, to the Saturday activities, to the wedding ceremony (the “Chapel in the Woods” looked absolutely spectacular! ), to the cocktail tent & hors oeuvres, to the reception (with the gorgeous table decorations, delicious food, and totally rockin’ band), not to speak of the wildly dramatic fireworks – the entire weekend was completely magical. We could not possibly be more thrilled or more appreciative of your help in making it all possible. We have received dozens of cards and emails from family and friends saying how much fun it was, how much they felt a part of our family, and how clearly this wedding reflected Kendra and Jenny’s love for each other and for their guests. Their marriage is off to a fabulous start, with their first hours overflowing with joy. Thank you, we will forever be grateful. Hi Susan. Thank you again for all the exceptional work, food, service, etc., at Artrageous! Everyone RAVED about the food and service – brava! Thanks for your hard work to help make Artrageous a success!!! I know you went above and beyond the call of duty for this one. We have gotten great feedback from people. Assembling and distributing welcome kits that included renting and driving a truck to the venue since we had picked large logo bags as give-ways and they would not fit in her car! I am sure I am missing something, but the event went so smoothly that it’s hard to think of where Susan and Jess needed to step in to deal with issues! I would be pleased to work with them again. Hi Susan - I loved reading your blog and thinking about 2013. It was a great year for our family - and two beautiful parties with you to help celebrate! It is such a pleasure working with you. I feel like we "grew up together" from the Open Kitchen days! Your approach, planning, and execution are all-pro and I can't imagine working with anyone else. God willing, we will have many more celebrations to come! Thanks again for your help, thanks to your wonderful staff, and a happy, healthy and joyful new year to all!!!!! The party was great! You and your staff are so wonderful and take such care in making everything run smoothly, beautifully and deliciously. The layout was really attractive and facilitated good movement for socializing. 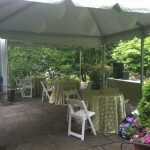 Everyone commented on how wonderful the food and service was and how unobtrusively everything was orchestrated. Many people asked for info on your services! Also, your staff people are so nice and personable and professional down to each individual. And they left the house neater and cleaner than they found it! What a fabulous party. I am going to start forwarding some of the emails I am getting from our guests. Plus the kid’s friends have been bombarding them with texts about how great it was. It just all came together perfectly and I know it was no accident either. You all worked so hard!!! And yes, Owen and Sara keep thanking us for holding such a great party for them, they are very, very appreciative. Only thing left here now is the port a pottie (hands down most talked about thing at the party after the food and the music). You need to thank all your staff for me. The only way I can adequately thank them is to describe the difference between working with true professionals and amateurs. The amateurs would have interrupted me at 10 PM and asked me, " Where do you want all the leftovers... the refrig is full, what should we do?" Your professionals just did the exact right thing. They were in the kitchen, unloading my already full refrigerator, repacked it with all the labeled leftovers and then managed to fit in our stuff as well and cleaned up. I never even gave it a thought or was pulled from my guests. That kind of adult thinking is just priceless and quite rare. Oh and the leftovers fed the whole neighborhood last night. Delicious! Plus there were a myriad of details that just got done. All the small things that made it perfect and there were hundreds of them. Jessica was awesome, I know she was always observing what was happening and making sure it was all good. It could not have gone better, I would not change one detail. It was beautiful and seamless and totally fun. Thank you, thank you, thank you! We think this was your best party ever and a wonderful way to celebrate the marriage of Owen and Sara. 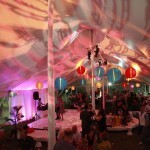 We loved the tent and the South Beach decor. The food was fabulous, the cupcakes were a hit, the bar was outstanding, it was all so nicely done. Greg really appreciated the lanterns lighting the way to the vans as well as the lanterns in the very dark parking lot. We really can’t thank you enough for all the work planning and executing the whole shebang which you all did in the utmost professional manner.